1 How does 3D printing improve your health? Three-dimensional (3D) printing has a long history. Since its unveiling 30 years ago and now opening up new opportunities in a variety of industries. Following the way of innovation and advancement, 3D printers are designed to provide faster prototyping ideas, solve problems with greater creativity and increase profitability. The potential of 3D printing is far-reaching, and one sector that is about to benefit greatly is biomedicine and the healthcare industry. The impacts of 3D printing go beyond its practical benefits. According to The Guardian, the technology is expected to be worth no less than $ 1.3 billion by 2021. In addition, it assume that will interrupt the cost of several medical procedures. The typical kidney transplant, for example, costs an average of 330,000 dollars, according to the National Foundation for Transplants. The conventional 3D bioprinter, on the other hand, sells for only 10,000 dollars. In the near future, the prices of medical procedures and biomedicines could experience drastic fall of price due to 3D printers if competition increases. Regarding the reducing costs, 3D printers can also simplify treatment. How does 3D printing improve your health? The technological advances change the future that we never everything think of still now. Some sectors experiencing a true revolution due to these developments. The health sector is one of them, which achieve the extreme effect from technological advances. We have been watching for years how science and technology are progressing faster and faster. It seems like yesterday when the internet came to our homes, or when electronic devices started to get smaller and smaller. For us right now it is impossible to understand everything around us without these advances. Technology continue to give much in the field of health: reproduce legs in 3D or create meniscus tailored to each patient. So that it can be, implement after the operation. Some of the projects that already working on it! The 3D printing splints control the amount of pressure on the skin and have spaces in case there is a wound, not having to remove it to heal it or do some cleaning. The custom splint is generated through a 3D scanner of patient’s limb. Instead of a conventional plaster, these 3D splints are 75% lighter, tolerant to water, lightweight – they weigh only 350 gr – and allow a greater comfort both on a day-to-day basis and in rehabilitation. 3D printing help pharmacologists with a new level of precision that can design various 3D-printed drugs pills. They provide a potential solution for those suffering from a variety of illnesses and need to take a large amount of pills. Some of these medicines who suffering from hypertension and diabetes, produced by a 3D printer. The ingenious design of these drugs allows launching different therapeutic compounds at specific times intelligently. 3D printers have successfully recreated parts of the body as complex as blood vessels, which shows that this technology has a lot of untouched potential. Now, medical professionals already make the organoids (mini organs). In 2017, a team of biomedical engineers from the University of Pohang in South Korea, using a 3D printer and living tissue, succeeded in developing what they called bio-blood vessels. The cloning of any organ of the body has long been a dream of the 21st century medical sector. The disruptive nature of 3D printing just scratch on the surface of the possibilities. An integral framework that allows the production and analysis of these small pieces of tissue. That can developed to encourage the creation of organs. A development that would provide a step forward in the need for organ transplants. 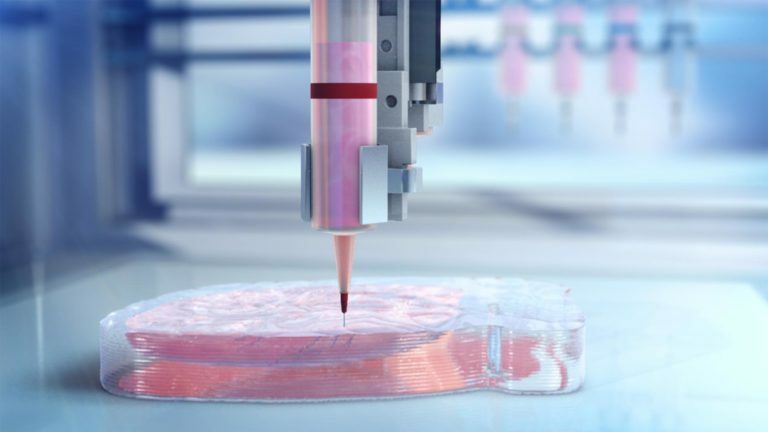 3D bioprinting opens a wide field of possibilities. The scientific and business world creating an artificial heart. It is not fiction; there is already a company in the USA that is working on it. It is called Biolife4D and a human heart is recreated by using a patient’s own cells. Which a priori would greatly reduce the chances of rejection. The process start by magnetic resonance of the heart and taking a sample of blood for creating cell patterns. The techniques is even more complex than it might seem at first. Since the 3D bio-printer has to protect these cardiac cells throughout the process so as not to damage them. Once the heart replica is complete then it keep into a kind of bioreactor. Which follows the conditions that inside the human body, the cells response and the heartbeats begin. This aspiring project has plan to replicate the other organs, such as liver, kidneys or pancreas. As they first started complex organ like heart. Because this impact can apply on thousands of patients. The statistics support this policy. After all, only in 2016, more than 3,000 such interventions were performed in US. One in four is related to death by heart disease. It is not so far 3D bioprinted heart will transplant shortly. Already surgeon Dr. Shi-Joon of Hospital for Sick Children in Toronto doing a test before making an intervention. Where the medical team printed a 3D replica of the heart of a baby to practice on it. So finally, they could perform well for complicated surgery. Many companies involved in 3D printing technology in various field. Its advances in medicine, medical prostheses or surgical implants. Even NASA expects to print food in space for astronauts. Its application limit seems to be only in imagination. In fact, the latest report Global 3D Printing says that the 3D printing production will grow at a rate of 25% per year until 2020 and the demand of both individuals and companies will not stop growing. It is evident that 3D printing will completely change the rules of the game in production. Surely, its advances improve our lives & society. We do not know what the new scope of 3D printing will be in future. It is clear that every day our life relate with 3D printed objects.